Have you noticed anything new on your My Rotary profile? If you said “Skills and Interests” you are right! 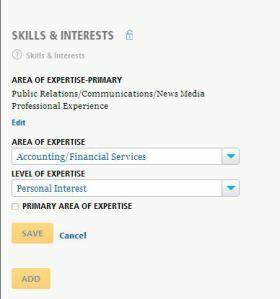 You can now add, edit, and remove “Skills & Interests” on your profile. 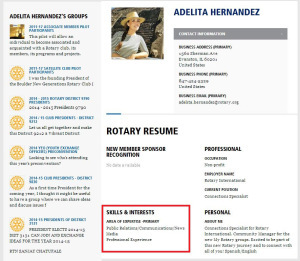 If you unlock your profile other My Rotary users will be able to see your “Skills & Interests”. This will also make it easier to find and connect to subject matter experts when your club is embarking on a new service project. It’s easy to add multiple “Skills and Interests” by selecting from the list of 20 Areas of Expertise. You can list your primary area of expertise and also designate if you have Personal Interest, Professional Experience, or Volunteer Experience in the selected area. Take a few minutes to add “Skills and Interests” to your profile so you can make more effective connections.